Students and staff from BA Interior and Spatial Design (ISD) at Chelsea College of Arts along with diverse practitioners connected with the University of the Arts London investigated ‘production’ as the theme of this year’s Tate Exchange event. Over the course of five days, staff, students and alumni collaboratively delivered an experimental programme concerned with the role of art in society. 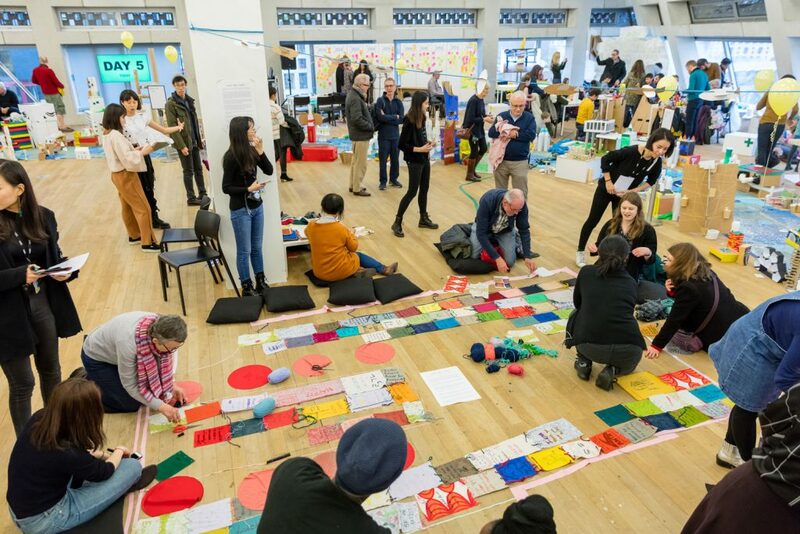 ISD tutors Marsha Bradfield (Artfield Projects) and Shibboleth Shechter (Tate Associate) co-curated a programme that explored the production of future communities. This stemmed from the conviction that our shared sustainability depends on cultural and other forms of heterogeneity. Communities are not something we can take for granted. They must be produced and reproduced in response to diverse conditions and considerations. Producing Future Homes and Communities convenes a community-of-communities that considers the significance of museums and other cultural institutions while grappling with the materiality of community and how it is shaped through structures, systems, networks and other relations. This was explored through a series of public workshops that considered the future so to better understand the present: smart cities, climate change, generative and other materials for urban expansion and renewal, as well as so much more. 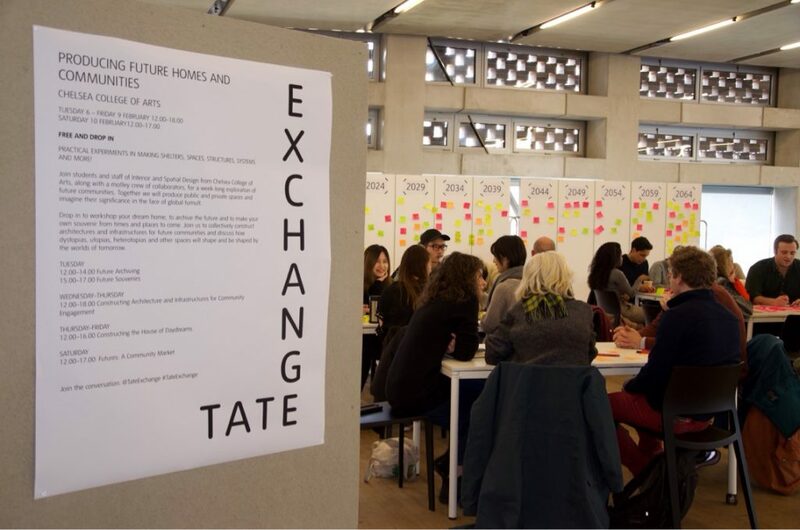 At the Tate Exchange members of the public could workshop their dream home, to archive the future and make their own souvenir from times and places to come. 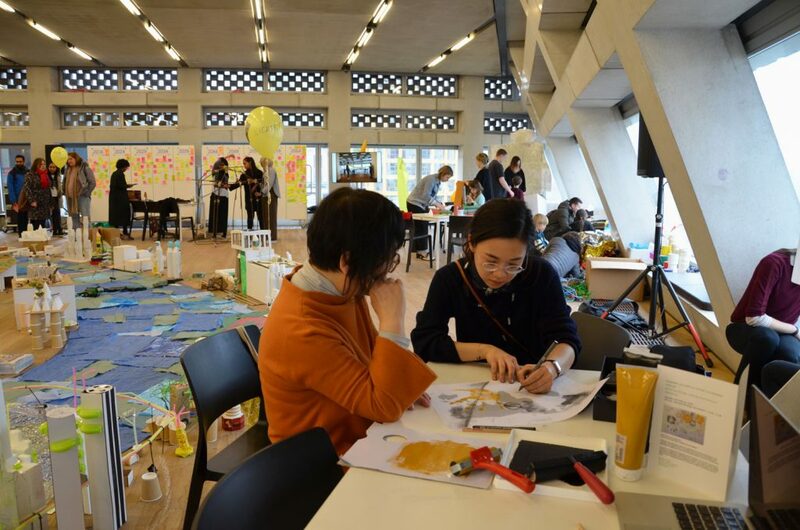 Participants collaboratively constructed architectures and infrastructures for future communities and discussed how dystopias, utopias, heterotopias and other spaces may shape and be shaped by the worlds of tomorrow – Tate’s collection was then explored with these in mind. At the centre of Producing Future Homes and Communities there was a large-scale experimental build. Using recycled materials from Tate Modern and beyond, it was collaboratively designed and created by students and members of the public over the course of several days. This model imagined the architectures and infrastructures of tomorrow, asking what forms will social, economic, technological and other systems take going forward. It questioned how these would be integrated and what structures and other resources would be required to support the changing needs of education, ageing, waste management, and other factors. It showcased creative practices from disparate points of view that variously propose utopic, dystopic and a medley of other scenarios. ISD students along with tutors Peter Maloney and Matt Schwab reflected on the changing importance of the home to consider the broader contextual relationship of ‘the domestic’ to the world – the relationships between public and the private spaces. Over the course of several days, students generated an archive of domestic spatial memories, rituals and narratives, seeking inputs from visitors and contributions through a range of workshops and events. There was an opportunity to generate models, drawings, written and spoken narratives and visitors were invited to leave their memories in virtual reality.